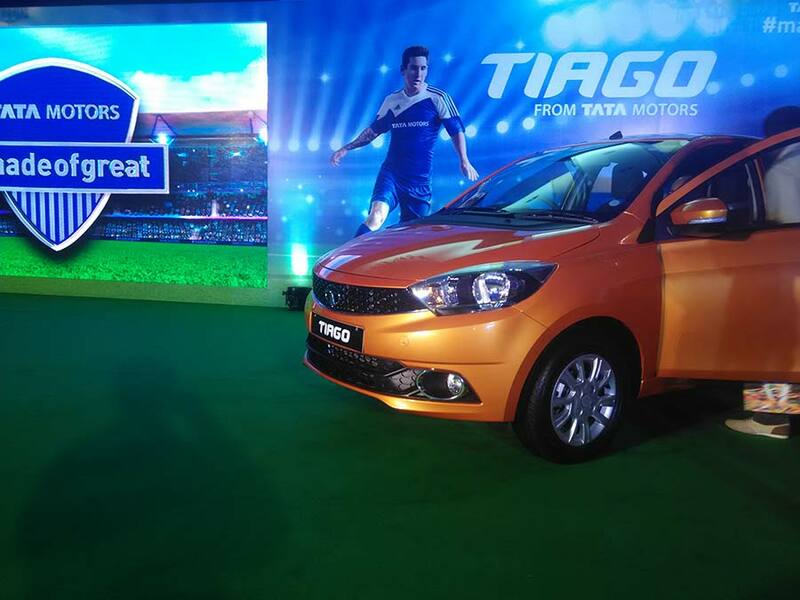 Tata Motors today announced the commercial launch of its cool new hatchback in Bangalore, the TIAGO with cutting edge design, technology and driving dynamics to create new segment benchmarks in the industry. At a starting price of INR 3.32 Lakhs, ex-showroom, Bangalore, for the Revotron 1.2L (petrol) variant and INR 4.08 Lakhs, ex-showroom, Bangalore, for the Revotorq 1.05L (diesel) variant, the TIAGO will be available for sale, across the country in over 597 Tata Motors sales outlets, from today. Tata Motors will also take its customer service engagements to the next level with the launch of Tata Motors | Service Connect, a new customer application for TIAGO customers, to make the post-purchase experience easy and stay connected with them at all times for a hassle-free service experience. Besides providing free pick-up and drop service, Tata Motors Service will also offer loaner cars for repair services if it requires the car to be at workshop overnight. The TIAGO reflects our passion and commitment to bring exciting, technology driven cars into the market. Class leading features, advanced driving dynamics, outstanding fuel efficiency, offers a great value for a contemporary, young car. 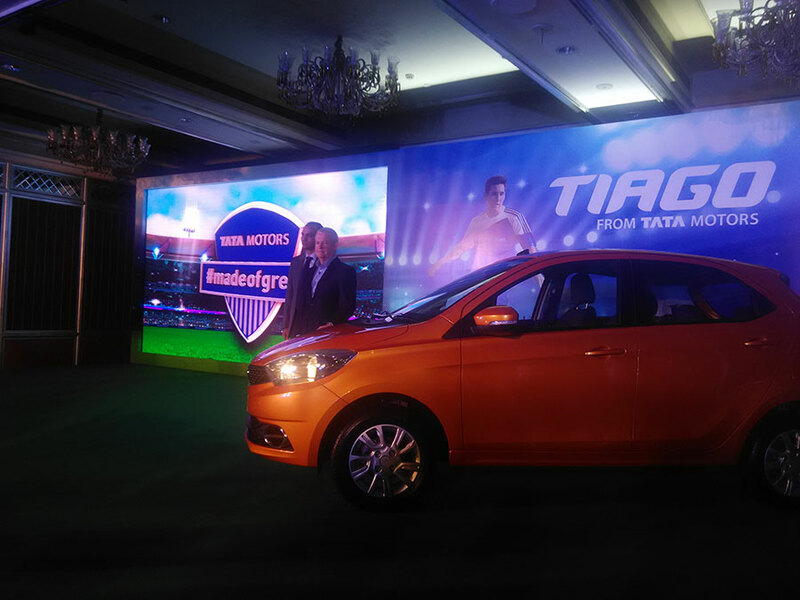 The TIAGO is the first car to be launched under our Made Of Great campaign and the first to embody our new IMAPCT Design language. This globally benchmarked car, represents the next big leap in our transformation journey. We are confident that TIAGO’s strong and distinct character will make it stand out in this highly popular but immensely competitive segment. With inputs from the Pune, UK and Italy design studios, the TIAGO’s appealing exterior design has a dynamic silhouette to emphasize the compact look and sharp design. The new 3-dimensional ‘T’ Logo is placed in a semi vertical position on the signature hexagon grill, giving it a bold, expressive face with a confident, agile stance. TIAGO’s interiors have been crafted with utmost precision for a premium feel. The geometric texture accented with chrome handles, knitted fabrics, colour harmony, layered design theme with a dual tone interior, customisable air vents, premium graphics on the fabric and body hugging seat bolsters all give it an upmarket, inviting feel. The stylish design is complemented by enhanced performance and driving dynamics. The TIAGO will be available in petrol and diesel variants with two new engines – Revotron 1.2L (petrol engine) and Revotorq 1.05L (diesel engine). These have been indigenously developed by the company and globally benchmarked for a refined road performance. Both these engines have been designed and programmed to deliver superior fuel economy and a peppy driving experience with a segment-first feature, the Multi-drive mode – City and Eco – making it equivalent to offering two engines in one. The two drive modes are supported by an advanced Engine Management System (EMS). Tiago’s many safety features include dual front airbags, advance 9th generation ABS with EBD and corner stability control, rear parking sensors with display on infotainment screen and energy absorbing body structure for superior safety. Talking about the mileage, TIAGO comes with class leading fuel efficiency of 23.84 km/l on Revotron 1.2L petrol and 27.28 km/l on Revotorq 1.05L diesel (as per Automotive Research Association of India certification), under test conditions. Significantly, under high-stress conditions at the recent Geared For Great Challenge, TIAGO ran through the ultimate endurance test to do an unbelievable 50,000 kms – something that would take years for an average car consumer in real life. Under the aegis of FMSCI, the petrol and the diesel variants ran flawlessly for 18 days straight while averaging 120 kmph. Recognising the dynamic consumer world with increasing need for connectivity, TIAGO comes equipped with an infotainment* system designed exclusively by HARMAN. The car comes with new segment-first applications like the Turn-by-Turn Navi app and the Juke-Car app. Available in 5 variants – XB, XE, XM, XT & XZ with optional variants in XE, XM & XT, TIAGO will come in six exciting colour options – Striker Blue, Berry Red, Sunburst Orange, Espresso Brown, Pearlescent White and Platinum Silver. 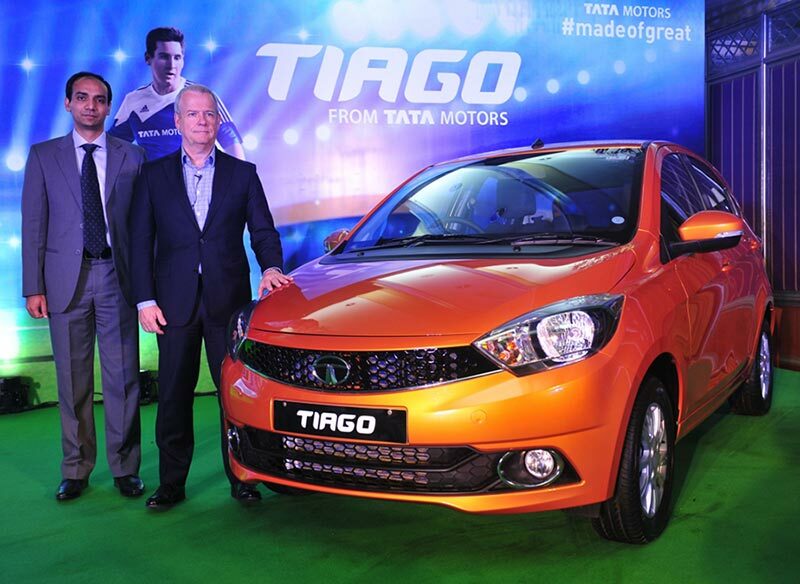 Check out the pictures of all Tata Tiago colours. The car will come with a warranty of 2 Years / 75,000 KM (whichever is earlier) with an extended warranty option of 2 years + 1 year (3rd year extended warranty up to 75,000km) or 2 years + 2 years (3rd and 4th year extended warranty up to 1,00,000 kms).